Both #1 York and #2 Leavitt were undefeated heading into the Girls Class B West Final. Something had to give. 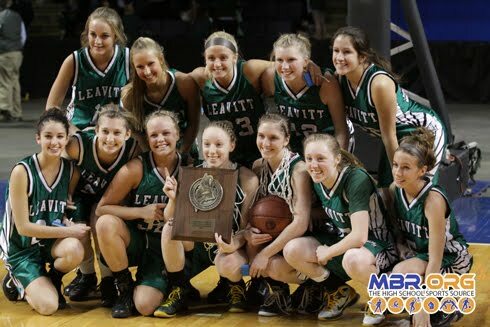 In the end, it was Leavitt ending York's 42-game winning streak with a 58-55 overtime win. The game got off to a blistering pace, as both teams were hungry to cut down the nets. Kristen Anderson scored 8 points for Leavitt and it was all tied at 15 at the end of the first quarter. Steph Gallagher paced York with 6 points in the quarter. The pace slowed down in the second quarter, as fouls and turnovers were more common-sight than points. York would go on a 6-2 run to end the half, and take a 25-23 lead heading into halftime. Emily Campbell scored 6 of her 10 points in the quarter. Leavitt would step on the gas to open the second half, opening with a 9-2 run. Courtney Anderson keyed the run with a 3-pointer and a lay-up as the Hornets took control. Nicole Taylor was the only York scorer in the quarter, with 6 points, as Leavitt led 36-31 heading into the fourth quarter. York would find their way, going on a 9-0 run to start the fourth, with Taylor chipping in 7 and Gallagher 2 points. Leavitt would then go on a 5-0 run of their own to go up 43-40 with 3:20 to go. York would tie it up at 47-47 with under a minute to go, and had the last shot, but couldn't get it to go. 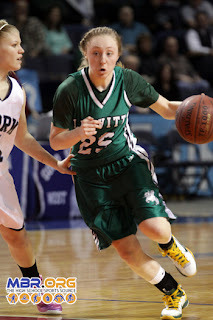 It was all Hornets in the extra session, as Kristen Anderson had two long 3-pointers to give Leavitt a 55-51 lead. york had chances to come back, but turned the ball over. A Gallagher prayer at the buzzer fell way short, as Leavitt came away with a 58-55 win. The Hornets pushed their record to 21-0 while breaking the long Wildcat winning streak. Kristen Anderson lead Leavitt with 22 points, while her sister Courtney added 17. The Hornets will now play for the Class B State Title next Friday night at the Cumberland County Civic Center.